How can data stored on a cloud storage device be isolated to specific consumers via certain pathways? Cloud consumers can access cloud storage devices via alternative pathways that can compromise data security and integrity. A solution is implemented at the hypervisor layer or physical server layer to limit access and utilization of certain available paths. The storage path masking mechanism is deployed inside the hypervisor or operating system installed on the physical server. 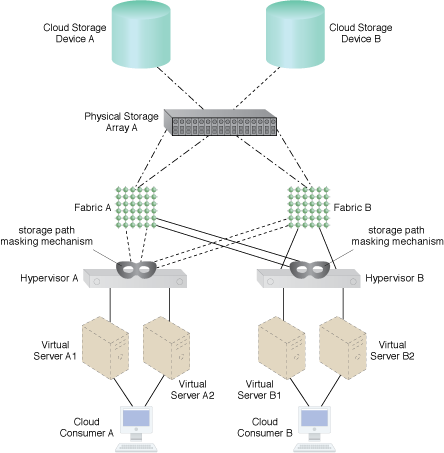 A storage path masking mechanism hides two of the previously visible paths to Hypervisor B.